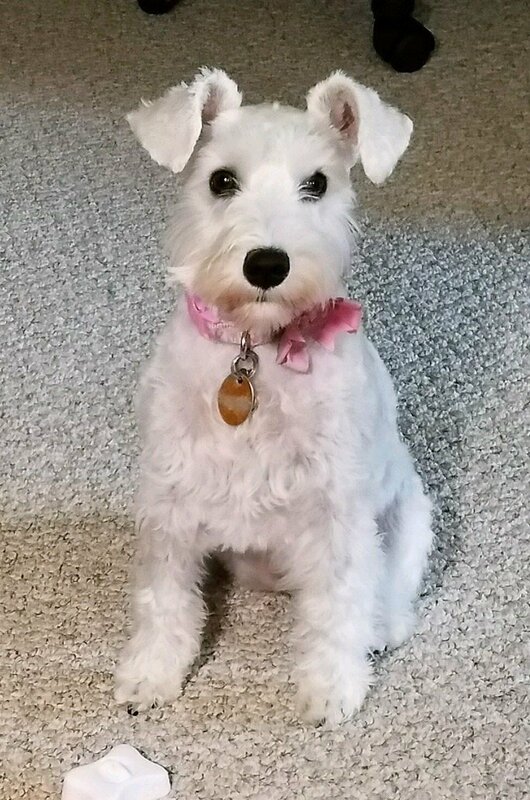 Born 10/04/2017 Princessa is up to date on all her shots, she is spayed and has graduated from puppy kindergarten. She's very intelligent and loves to play with toys and other dogs. she is housebroken and also will use a dog door. 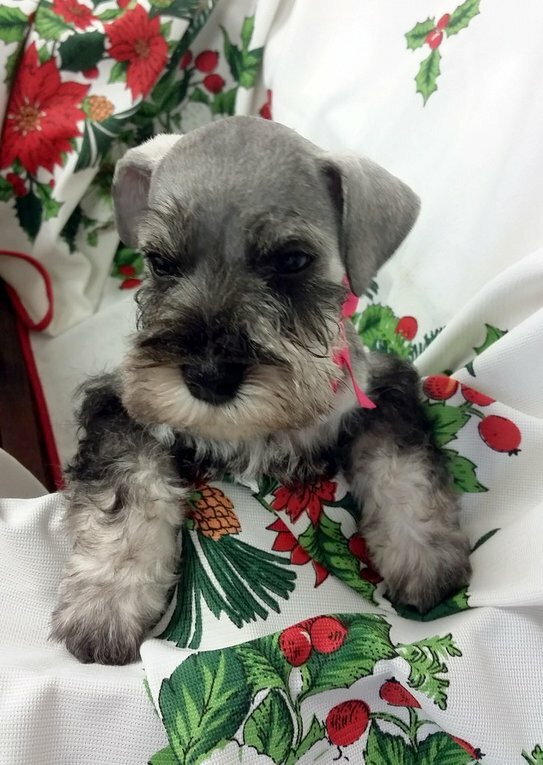 She is priced at $1500 for pet only BECAUSE SHE IS ALREADY SPAYED. 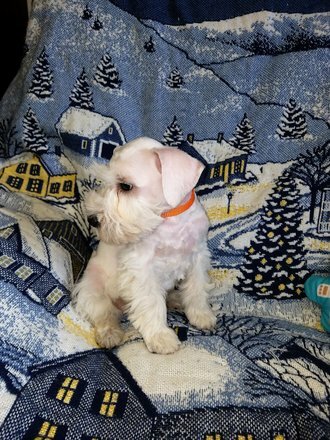 ObiWan and Flower: an all white litter born August 18, 2018 This litter of 5 remains all NATURAL with tails and ears due to owners wanting them all Natural for SHOW . Puppies will be available after Oct. 13, 2018. 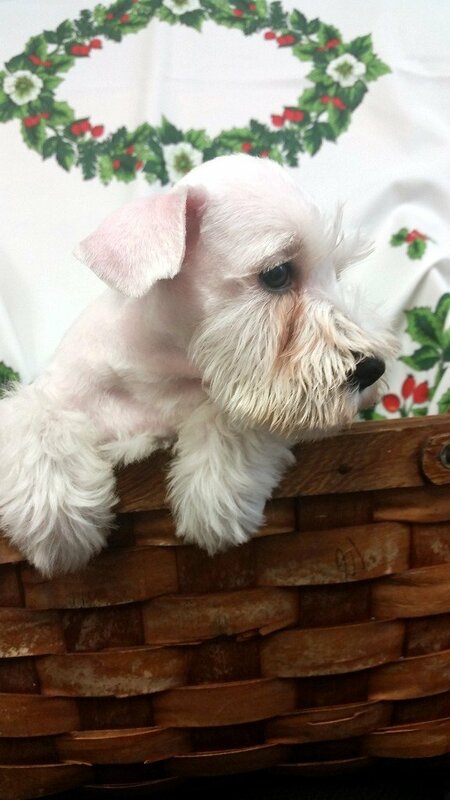 Only One white female available in this litter for show or pet, the others are all reserved. New pics coming soon. 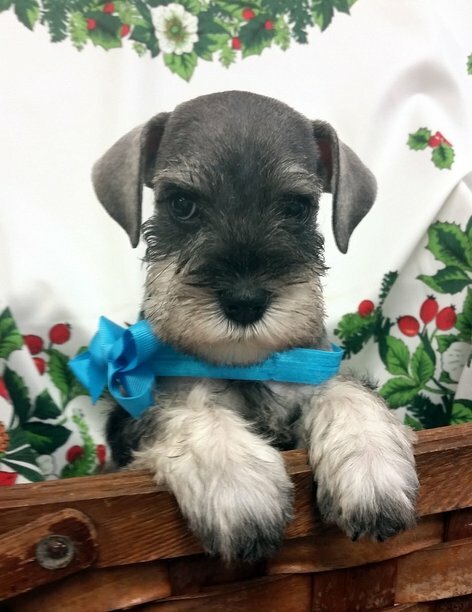 Black & Silver male SOLD ! Ice Flower and Obi Wan : all white litter born Oct 4, 2017. Please note: our white puppies are pure white with BLACK PIGMENT and dark brown eyes according to the GERMAN PSK/FCI/UKC breed standards. We DO NOT breed the undesirable/unacceptable colors or patterns of white chocolate, parti, liver, merle, or brown pigment. We research our lines to ensure these colors or patterns are NOT in our lines. That is why most of our dogs are imported from countries that do not allow such unacceptable deviations from the true breed standard. CONTACT: Karin by phone or text 740-970-0095 for more info and sales contract. 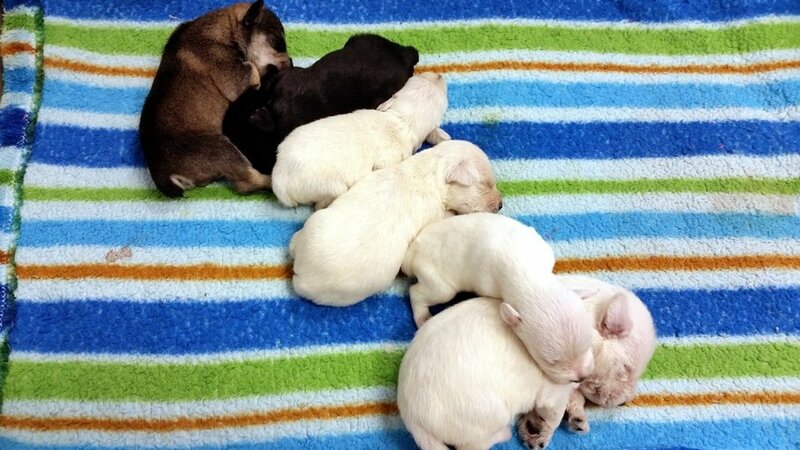 Please fill out the pre-purchase application on our web if you are interested in one of our puppies. Call or email me if you have any questions and I'll be happy to answer them. PLEASE CONSIDER THIS: Many people think they do not want a male puppy because they are afraid they will start marking in the house. Our little males make excellent pets! If you neuter a male before he is 12 months old and you potty train him correctly, he will not start marking the house. I have mature intact males in my house who do not mark. Also, if you have a pet female and are looking for a companion for her, males get along better with females. Two neutered males also get along great together as playmates. In fact, my intact males get along together! Our males are super loveable! Full registrations on breeding/show potential pups. 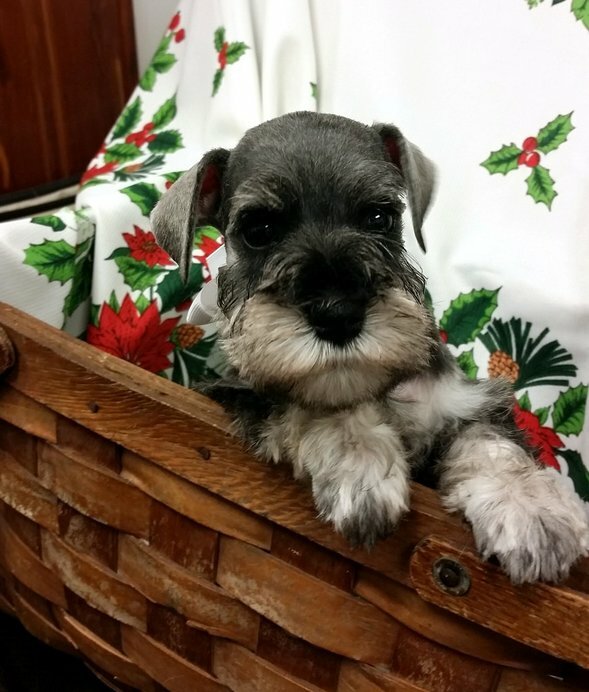 Limited AKC registrations for all puppies sold as pets which MUST be spayed or neutered. Three year Health guarantee on all puppies. Dewclaws removed and tails docked. Natural ears. Will be up to date on shots and deworming. Shipping charges, crates, health papers are extra. We do not guarantee any pup to be "show quality" until it has been shown successfully. A show/ breeding quality pup is one determined to be free of disqualifying faults and of excellent quality. Pups may be reserved on approval by non-refundable deposit $300 (inside USA) or $500 for pups being exported to foreign countries or future litters with natural tails if desired. We do not accept advance deposits for puppies remaining in the USA. We do not crop puppy ears. If you desire your puppy's ears cropped you must have your own vet do it. 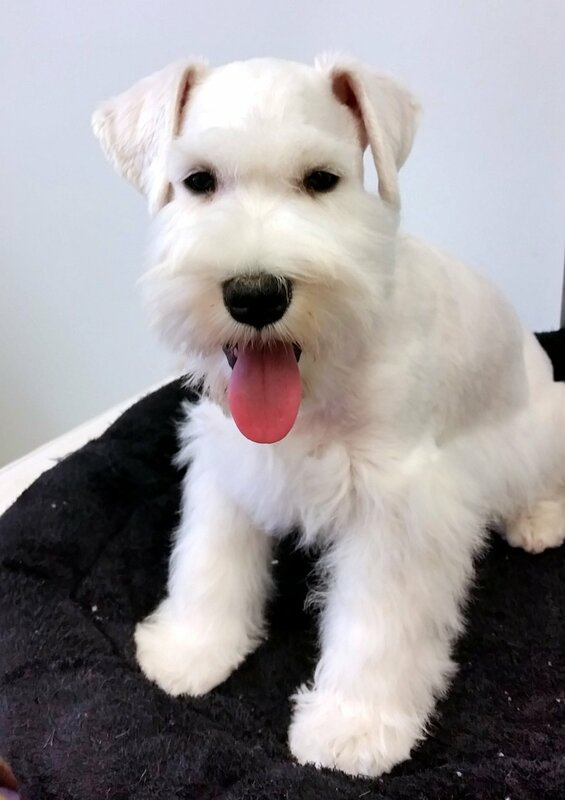 Ear cropping requires a lot of post-op care and we leave this option up to the new owners. A Pre-Purchase application must be approved before a deposit will be accepted. 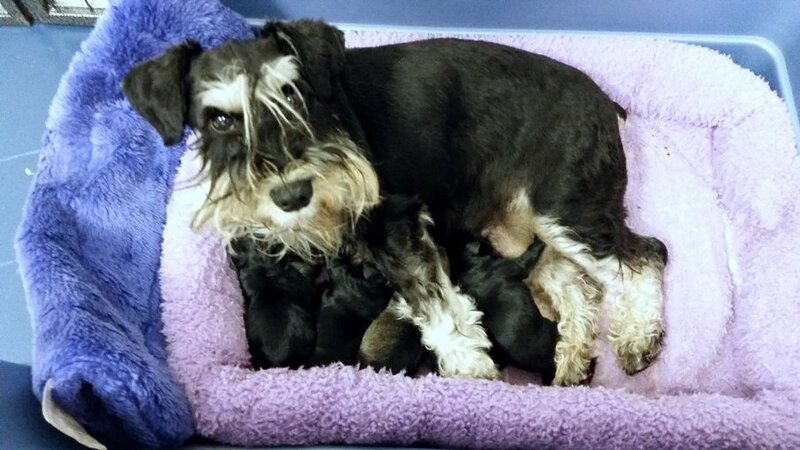 Deposits must be made before the pups are 2 days old for Natural tails or they will be docked. We ship worldwide depending on weather and destination country restrictions. We invite foreigners and all new owners to fly in to pick up their puppy to ensure the puppy's safety during the flight in cabin. Puppies can accompany their owners in the cabin of the plane in a carry-on soft sided crate. and a 3 year sales/health contract! 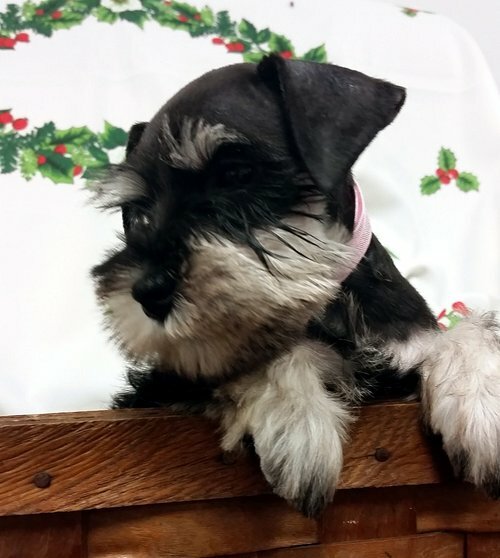 We will be happy to answer any questions you may have about our wonderful little Miniature Schnauzers. 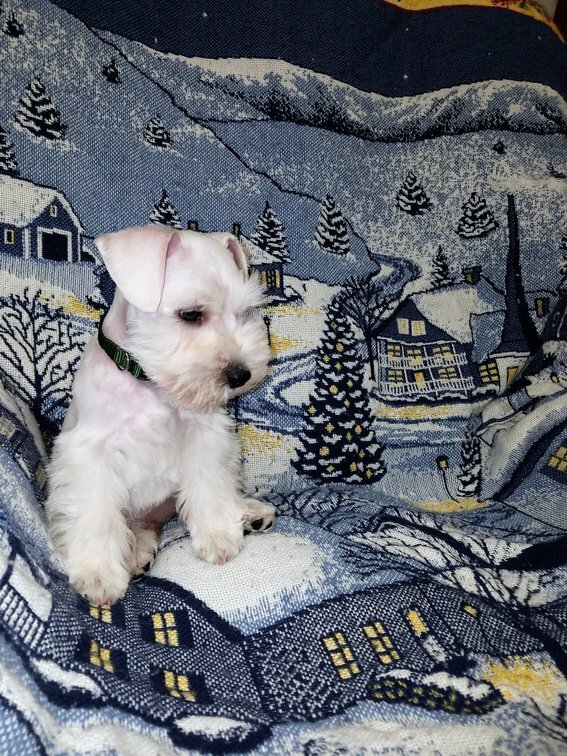 When you purchase or adopt a dog from Rice's Miniature Schnauzers you not only get a friend for life, but you also get our commitment to help you raise a healthy happy dog by being available to answer any questions or give advice when asked. We do not forget about our clients after they purchase a dog. We encourage our clients to stay in touch and let us know how each one of our babies is progressing. If you wish to pay by major credit card we can invoice you through PayPal. 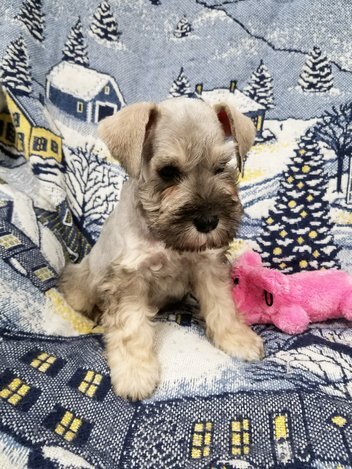 Rollin Jackson, S&P puppy out of PINK and RENNIE born August 20, 2016. 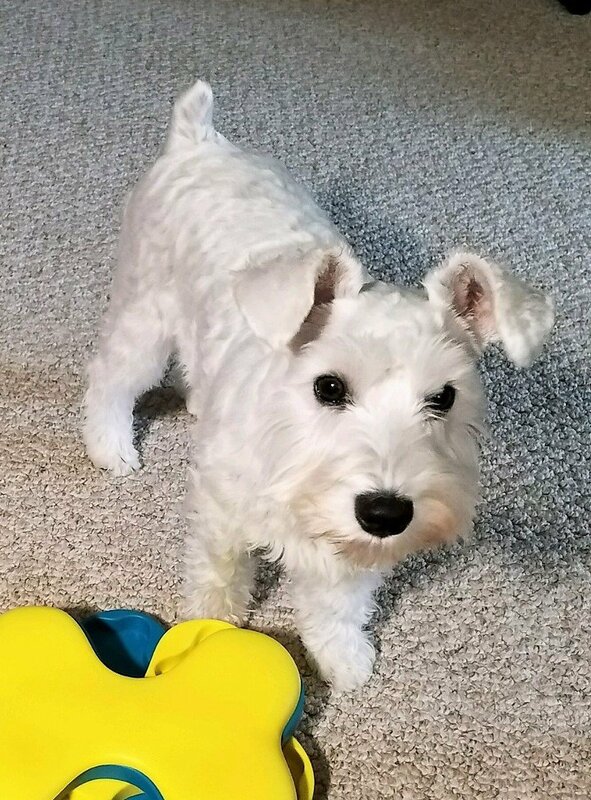 Pictured below, He is a very handsome boy who now lives in IL with his new family. 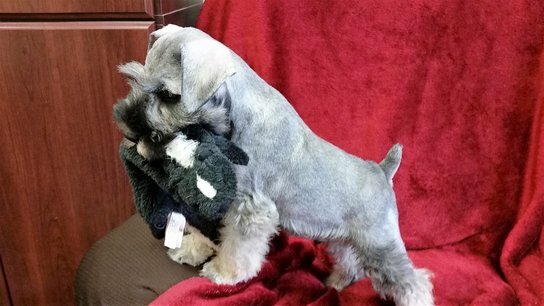 His sire is UKC CHAMPION, Renaissance V Brukenthal, who was Reserve Top Ten Miniature Schnauzer at the UKC Premier in Kalamazoo, Michigan in 2016. The puppies in these videos are all sold! Please fill out the Pre-Purchase application on our website if you are interested in purchasing one of our wonderful puppies out of a future litter. 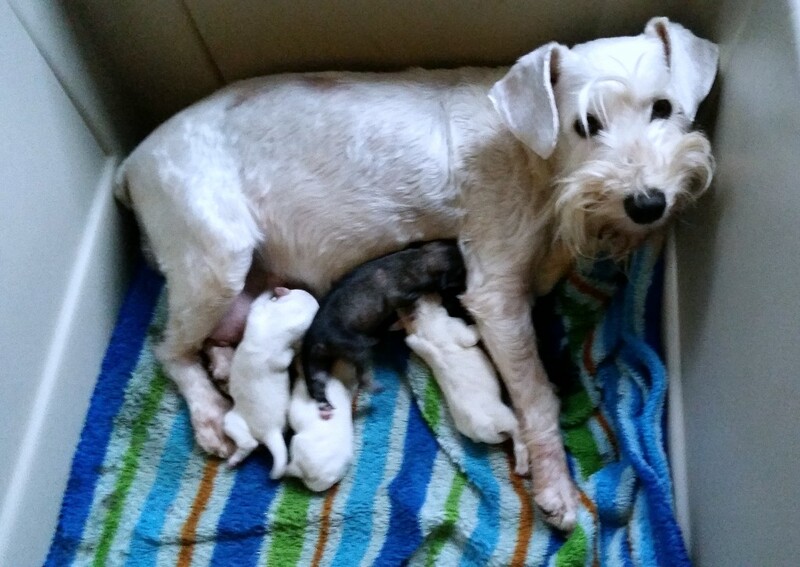 DEMI AND BARRY'S LITTER BORN OCTOBER 16, 2015. These pups are all in their new homes. Above is the red collar boy. Above is Blue collar boy. Above is Daisy. Her mother tried to pull her closer by her ear and pinched the tip off when she was first born,, but her owners think she is so adorable. Above is the B&S girl, "Mazzie" I am keeping for show. Above is Sophie girl. She resides with Mary and Richard. 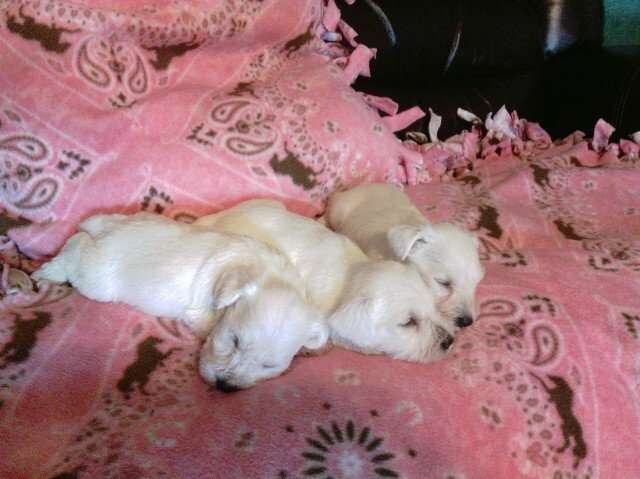 This white litter is all sold. 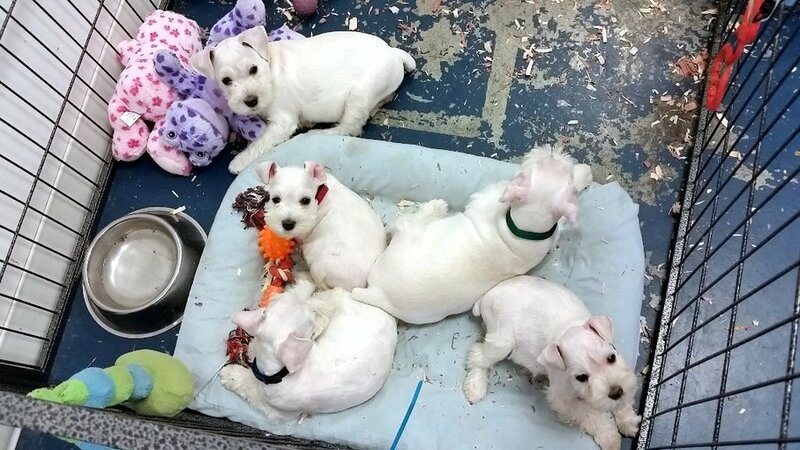 Boston and Harmony pups Pictured below at 8 weeks old showing off their new haircuts. CADE in now in his new home. All the puppies in the videos below are SOLD! The video below was taken 01/27/15 at 9 weeks old. 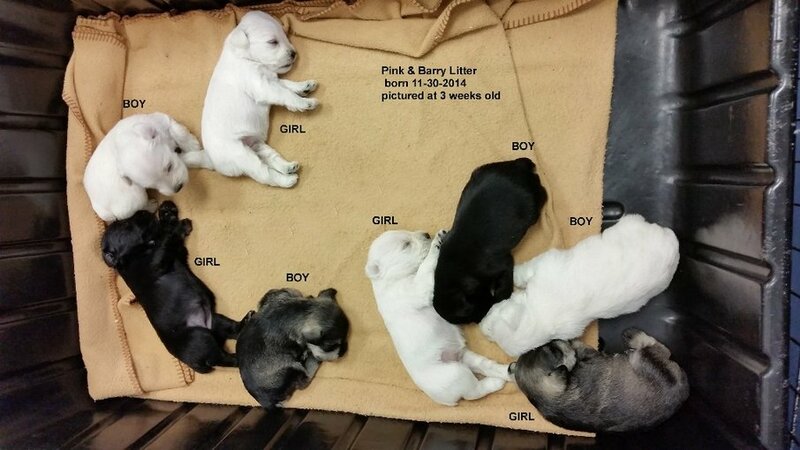 Below are Pink's puppies at 3 weeks: Notice how black the pigment is on the white puppies noses and pads of feet has turned. If you are interested in purchasing a puppy from a future litter please fill out the Pre-puchase application on this website and submit to us . You MUST fill out an application to be put on our waiting list. 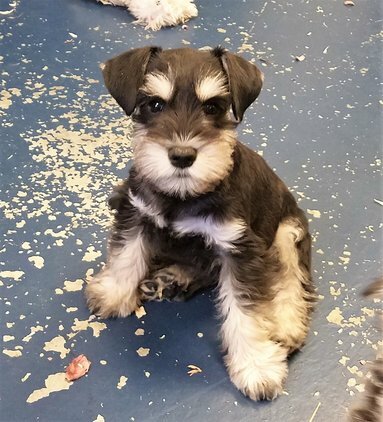 Our puppies are normally reserved within a week after they are born from people on our waiting list, so get your application in early because we notify people in the order we receive your applications.